White toilet roll holder with unique heart design. W 21cm D 21cm H 96.5cm. Roll holder width is 18cm..
White towel rail with heart design.W 31.5cm D 31.5cm H 93cm. The rack width is 31.5cm. The design fe..
Heart design wall hooks white in colour. W 45cm D 7cm H 27.5cm. Heart width is 11.5cm Small ribbons ..
White Heart design wall rack, perfect for any bathroom. W 28.cm D 15cm H 63cm. Distance between shel..
Metal key with four loose fitting metal hooks on a wooden back board. The metal is painted white wit..
Wholesale Keys Hanging Rack With Shelf 50 x 12 x 13cm. Manufacturers product code: N0146. Measures: ..
Metal napkin holder with metal weight in the shape of a fork. The overall size is 17.5cm wide, 17cm ..
Resin moulded key in aged antique silver finish.Overall length 78cm, handle width 32cm. A classy add..
Wall mounted varnished mango wood cabinet/shelf with 6 drawers & hooks. The overall size is 68cm.. 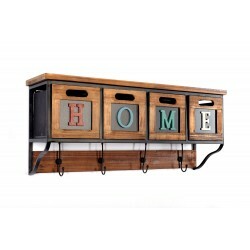 Solid wood bracket with 4 large hooks and 8 smaller hooks. A sturdy product, well made from so..